The Rio Grande Water Conservation District (RGWCD) works to protect water rights and promote efficient and sustainable water use within the San Luis Valley in south-central Colorado, in the upper portion of the Rio Grande basin. In 2005, after consultation with the RGWCD, Connie Woodhouse developed reconstructions for four gages (on the Rio Grande near Del Norte, Saguache Creek, Alamosa River, and Conejos River) which represent most of the surface water supply for the San Luis Valley. In 2008, Connie generated an updated reconstruction of the Rio Grande at Del Norte in which the calibration extends through 2002, and this updated reconstruction is archived in TreeFlow. A forward stepwise regression procedure was used to calibrate the observed flow record with a pool of potential predictors consisting of 15 tree-ring chronologies from Colorado and northern New Mexico. The residual chronologies, with the low-order autocorrelation removed, were used. Four predictor chronologies were selected by the stepwise procedure for the reconstruction model. Validation statistics were computed using a leave-one-out (cross-validation) approach. Figure 1. 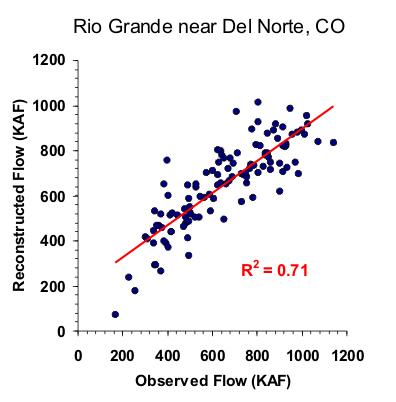 Scatter plot of observed and reconstructed Rio Grande annual flow, 1890-2002. Figure 2. Observed (black) and reconstructed (blue) Rio Grande annual flow, 1890-2002. The observed mean is illustrated by the dashed line. Figure 3. Reconstructed annual flow for the Rio Grande (1508-2002) is shown in blue. Observed flow is shown in gray and the long-term reconstructed mean is shown by the dashed line. Figure 4. The 10-year running mean (plotted on final year) of reconstructed Rio Grande flow, 1508-2002. Reconstructed values are shown in blue and observed values are shown in gray. The long-term reconstructed mean is shown by the dashed line.